Have you seen the state of your apartment buildings’ mailboxes lately? Are they overflowing? Do they have broken doors? Maybe they just generally look less-than-secure. As a landlord or building manager, you have a legal obligation to take care of the buildings’ mailboxes. Moreover, managing apartment building mailboxes is a way to improve tenant satisfaction and keep happy tenants living in your property. Not sure what this means or want to know more? Read on to learn about great ideas for your apartment mailboxes. When you’re a landlord, your subject to many different federal and state laws designed to protect your tenants. Some of these laws relate directly to the mailboxes. Any mail receptacles need to be approved by the United States Postal Service (USPS) before they’re installed. And you need a proper mail receptacle because the USPS won’t deliver to door slots because they’re not considered acceptable for apartment complexes. If you’re looking at a new receptacle system, be sure to run the model by your local post office before you install it. The law doesn’t go away once your new mailboxes are installed. It is your responsibility to maintain the mailboxes to make sure 1) the USPS can access them and 2) the boxes are in good working order. If the mail carrier can’t get to the boxes or they’re clearly compromised, USPS will not deliver to those boxes and mail service will be delayed. You’re ready to invest in one of those apartment building mailboxes, but which one will you choose? Well, you have a few options to consider. Let’s break them down by where they’re placed – either inside or outside of the apartment building. Tenants love indoor apartment building mailboxes because they’re secure, easy to use, and don’t force residents to stand outside in the rain or cold to get their mail. Indoor mailboxes also add an extra modicum of privacy because tenants can collect their mail and quickly enter their apartment without having to get through a parking lot or doorway. In most cases, indoor mailboxes are mounted on the wall or are installed into the wall. Remember: USPS will not deliver to door slots in apartment buildings. The danger with indoor mail receptacles is that they can often be quite small. Small mailboxes make sense from a building manager point of view because you want to minimize the common space taken up by the mailboxes. It’s a good idea to strike a balance between trying to save space and giving residents a good size mailbox. No one wants to have their mail stuffed into a tiny box only to find things damaged or lost in the fray. Not sure what size would best suit your community? Ask. If the whole building has an Amazon Prime subscription and orders everything from computers to cough drops online, it might be worth investing in parcel lockers. Lockers provide delivery companies a place to put packages that is safe, secure, and keeps the parcels from being left underfoot. These lockers are also a selling point for future renters- they’ll no longer need to wait in for packages, travel to a nearby drop-off point, or worry about their packages disappearing. But if you’re whole building has gone paperless and rarely receives packages, then you might find traditional envelope boxes work best. Fortunately, the USPS doesn’t have a problem with decorating your mailboxes. Often, you’ll be able to choose from different metallic finishes: aluminum, brass, and gold are the most common finishes but it is possible to custom order if the aesthetic is important to you. Additionally, you can paint them, paper them, or stencil them to get rid of the industrial look that many models arrive with. Though, you should be wary of voiding any warranties when making changes to them. Finally, some models allow you to choose the way the individual boxes are numbered. For example, you might choose an attractive font to engrave the apartment number on them. Keep in mind that what you do to them cannot in any impede the ability of the delivery service to access them or impact their security. Outdoor mailboxes are typically offered in styles distinct from indoor mailboxes. Their features are more utilitarian in nature because they need to be able to withstand the elements – both nature and human. Many outdoor mailboxes are cluster mailboxes. They work best for apartment buildings because they’re approved by the USPS and keep individual tenants’ mail secure. Security and compliance are the most important aspects of outdoor mailboxes. But just as with indoor mailboxes, there’s nothing stopping you from sprucing up the blank canvas you purchase from a manufacturer. Whether you have them engraved, painted, or order them to spec, you can have an outdoor mailbox design that best matches your neighborhood without limiting their practical use. Do you have a few ideas for your new mailboxes? Before you get carried away, let’s review some of the guidelines provided by the USPS for installation. The most important standard to consider when you’re designing your mailbox is the height requirement. Any commercial mailbox should be installed 48 to 67 inches above the floor. The letterbox lock shouldn’t be more than 67 inches above the floor. Parcel lockers are the exception to this rule – they can be installed 15 inches from the floor. 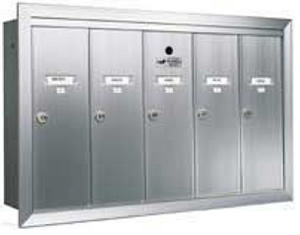 If you own or manage an apartment building, you need commercial mailboxes. Not only do they make tenant’s lives easier, but the USPS won’t deliver to anything else. But just because you’re buying commercial mailboxes doesn’t mean you have to sacrifice on style. Choose from one of the beautiful designs available or create your own look upon delivery – just make sure you don’t impact the functionality of the mailboxes. Do you need an upgrade to your mailbox system? Get a free quote!